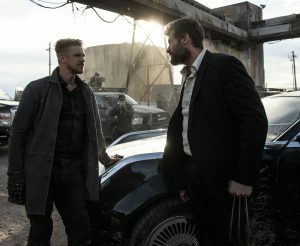 (l-r) Pierce (Boyd Holbrook) and Logan (Hugh Jackman) face off in LOGAN. ©Marvel/20th Century Fox. CR: Ben Rothstein. 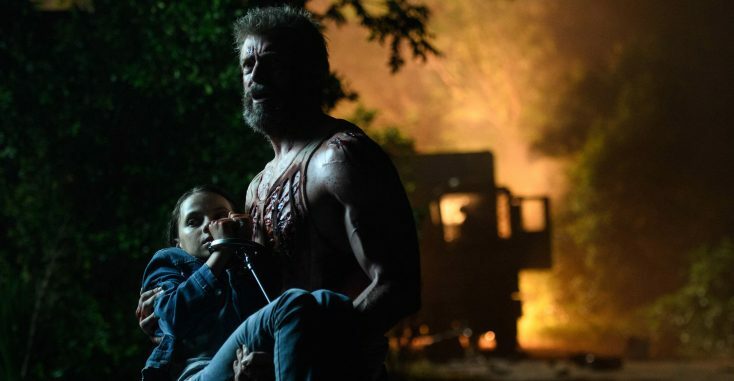 The latest Wolverine installment “Logan” is sufficiently ultraviolent and expletive-laden to earn the sometime X-Man the only “R” rating ever received by any Marvel movie other than last year’s diametrically different “Deadpool.” But where “Deadpool” was a ridiculously over-the-top black-humor romp, “Logan” is so unrelentingly gritty and grim that it sometimes comes uncomfortably close to resembling such depressing DC Comics downers as “Man of Steel” and “Batman V Superman.” Make no mistake, “Logan” is markedly better than either of those interminable bores, if only because it has a trio of main characters worth caring about. Still, it’s hard not to wish the dismal affair were just a little less dreary. “Logan” takes place in a future where no other mutants have been born for 25 years. “Maybe we were God’s mistake,” snarls an embittered and broken-down Logan, now reduced to scraping by as a limo driver who needs reading glasses. Former X-Men leader Charles Xavier (the always excellent Patrick Stewart) is a senile, brain-damaged wreck. Logan has secreted the prone-to-psychic-episodes Xavier in a remote south-of-the-border hideout to protect the world’s most powerful telepath from outsiders, and vice versa. Xavier’s caregiver is the albino telepath Caliban, played with impressively pathetic desperation by Stephen Merchant. A Mexican nurse (“Orange is the New Black’s” Elizabeth Rodriguez) begs Wolverine to take her and a mysterious child named Laura (a perfectly cast Dafne Keen) north, to escape the clutches of heavily armed commandos employed by the research lab from which Laura has escaped. After an excitingly well-staged and high-firepower car chase that earns extra points for cleverly subverting the standard crash-through-the-fence cliché, Logan, Xavier and Laura hit the road. Jackman is so convincingly beat down and bummed out that he makes Logan’s previous movie mopings about lost love Jean Grey seem almost lighthearted. Life’s disappointments also apparently have expanded his (and Xavier’s) vulgar vocabulary. Logan’s second word in the movie is the “F” bomb, which reoccurs with such frequency that it actually becomes annoying, as if the filmmakers couldn’t resist taking excessive advantage of the license granted them by having an “R” rating. Returning director James Mangold (who helmed 2013’s “The Wolverine”) and screenwriters Mangold, Michael Green and Scott Frank offer up enough stabbing, slashing, amputating and beheading to satisfy even the most bloodthirsty videogame devotee. In the movie’s most stylishly brutal scene, a deafening white-noise psychic attack from the wheelchair-bound Xavier freezes everyone in the vicinity of his casino hotel room, including a host of heavily-armed bad guys that Logan slow-mo struggles to kill with his claws. One major aspect of the film’s third act is disappointing, because it doesn’t have the same unlikely-but-acceptable credibility as what’s gone before. Having Logan mock what happens in a meta reference to X-Men comic books (which he insultingly refers to as “ice cream for bedwetters”) doesn’t help. Still, the movie’s final image is unforgettable enough to be considered iconic, which makes up for an awful lot of overkill and ice cream along the way.